From Bernie Osborne 3 rnds. Joe Salce 3 rnds. Joe Salce 3 rnds. Johnny Volpi 3 rnds. Joe Salce. 3 rnds. Ross Colussimo 3 rounds, Elly Clarke 3 rounds, Johnny Volpi, 3 rounds, Rocky Lang 3 rounds. Fred Cranston 3 rounds, Chris Robertse 4 rounds, Max Martial 4 rounds, Cec Rogers 4 rounds. 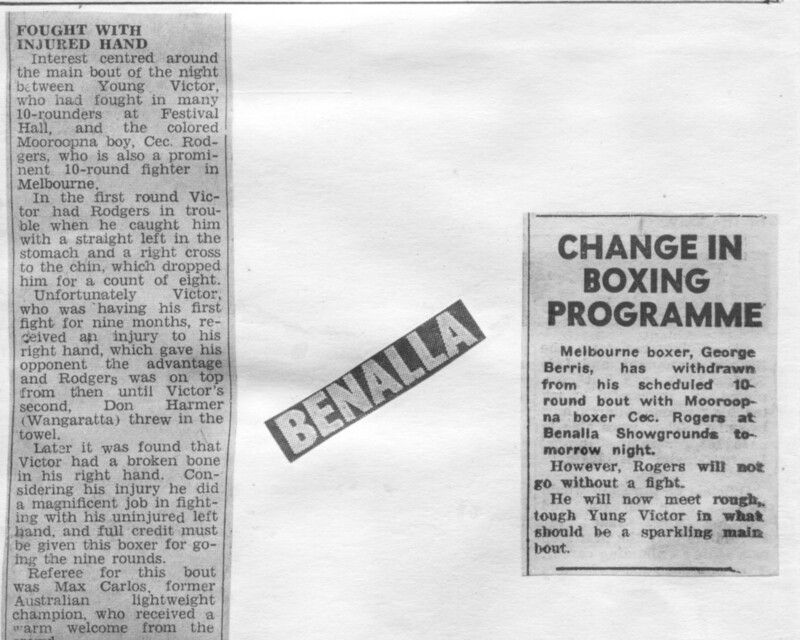 Below: What Australian Ring magazine said by "Norm Foster" Melbourne writer. Years later in 1985 Norm dropped into my menswear shop at Sydney Rd. Coburg and became a regular visitor for coffees with us right up to 1990. Norm nor I ever mentioned the bad writeup he gave me, truthfully I never even thought of it during all those years. The reason why I started slowly in this fight was because the longest distance in all my fights before this was 8 rounds. 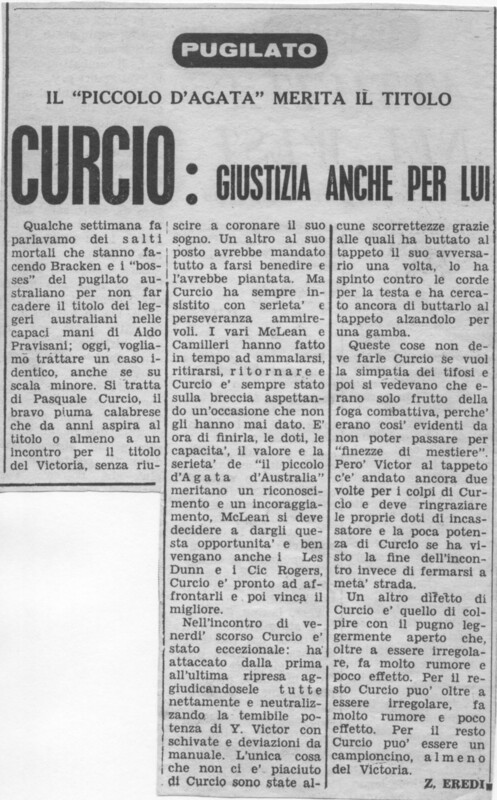 Curcio had 33 events prior to this 16 of which were 12 and 10 round fights, he had fought the likes of Bluey Wilkins, Aust. champion Johnny Jarrett , Victorian. champion Les McLean, David Floyd, Tommy Hepper, and Les ( popeye ) McNair. About the third round Snowy commented about me bringing my girlfriend to see this fight and to take the lead in the fight. He started making a fuss in the corner along with body language that made me feel rather very embarrassed. Snowy kept making a show of himself at ringside and verbally abusing me in words not worth mentioning here. Amazingly although I knew Snowy swore quite freely I had never seen this kind of attitude in him before and it put me in a state of defiance and did not fight. Yes Snowy upset me so much that I at my young age of just over 19 just didn't know how to cope with and kept it to myself. I had always been advised to change trainers and usually Ambrose Palmer was the recommendation. "No the writer got it wrong"
The reason I stayed with Snowy all that time is because I was faithful and I liked the man possibly because he did have a silent streak in him of niceness that may have been my own imagination, and with me being the naive, gentle and full of confidence I figured this may not be as important as it was. 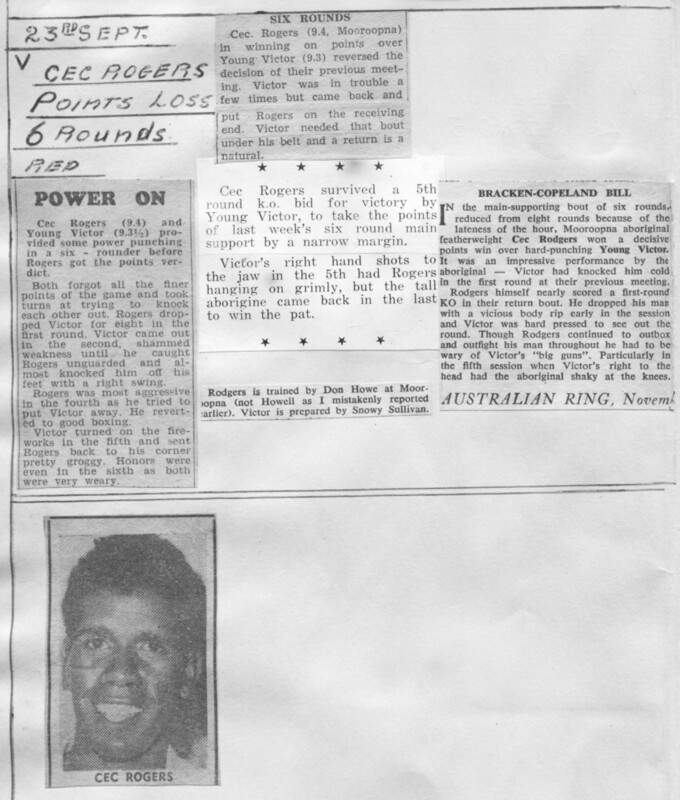 Snowy was an alcoholic and used to arrive in the gym always drunk to the degree that he could not stand up, very seldom not, I was advised numerous times by friends to go to Ambrose Palmer. George Edwards (usher at festival hall) lived across the road, Brougham Str. and had keys to open the gym "rain hail or shine" George was always there. 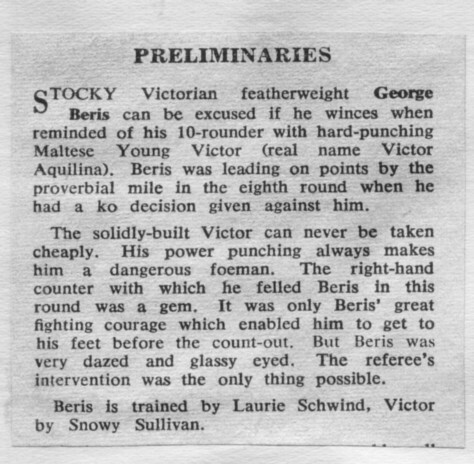 My then trainer for this last fight was Laurie Schwind did not attend the fight, Victor fought with a broken right hand suffered in the second round until the pain became unbearable by the end of round nine, Victor just had to see out the fight to win on points. 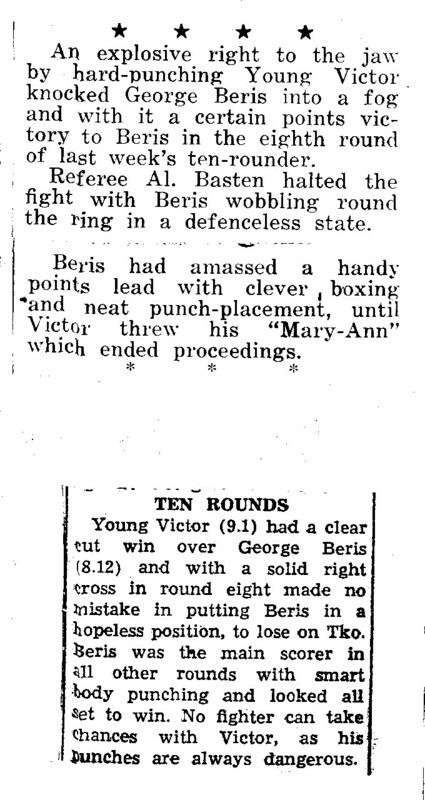 Victor had Rogers down 3 times, the first was in the first round for a count of 8, the second was through the ropes down onto the judges table (judges used for amateur under-card) with no count applied and the third when another blow had Rogers out like a light in centre ring, this time the count was stopped as the ring post fell (sabotaged as we were all exactly in centre ring) and took about 5-6 minutes to repair. The referee was Max Carlos. I had making a comeback in mind with Angelo but had to move to Ambrose Palmer's gym. after a couple of weeks. 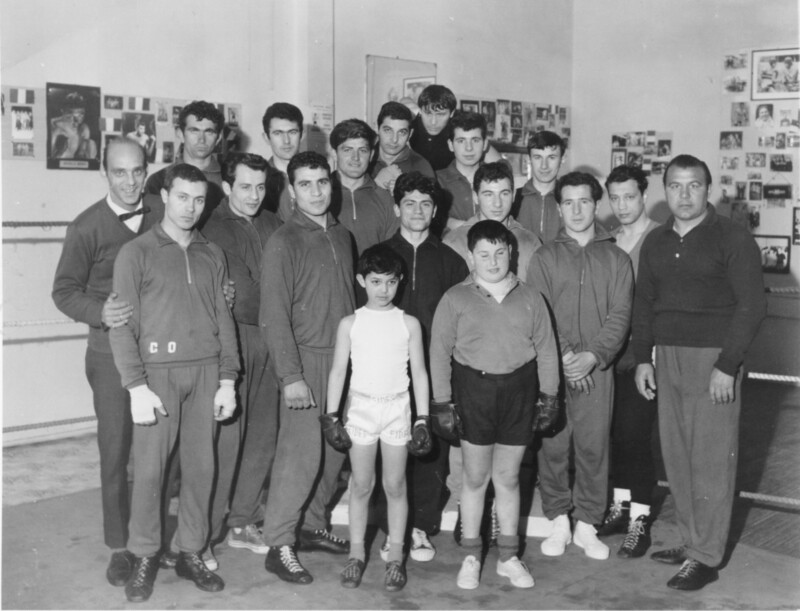 Angelo had a problem with not speaking one word of English at the time, he just loved the way I attacked George Fogus during a sparring session which turned a little sour because of roughness in sparring, I always pulled punches sparring but Fogus roughed me up so I did what I did best. 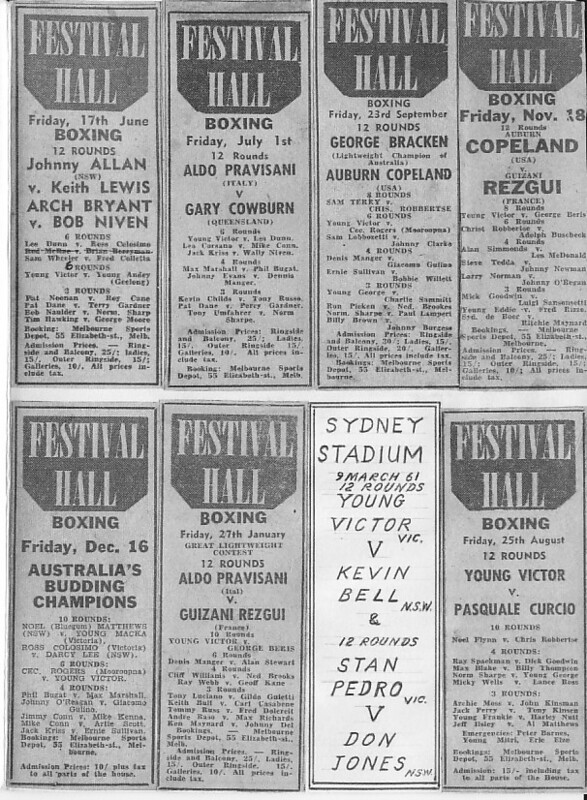 I believe he had just fought for the Australian welterweight title the week before. I have been a great believer throughout my life in "DO UNTO OTHERS WHAT THEY DO UNTO YOU"
Here I spent 8 months getting into very good shape and Ambrose told me that my first return fight would likely be with Leo Young. I spent this time training at top level mostly with Johnny Famechon and some with Aldo Pravisani, sparring many rounds with both. 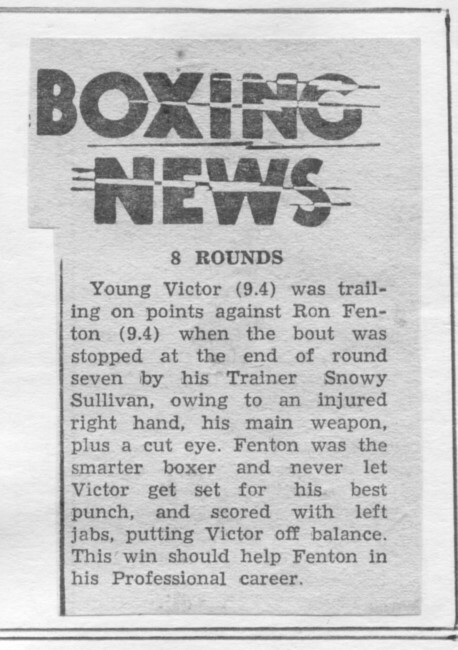 If 3 years earlier this is where the Victorian title could have changed hands as Les Mclean was also returning to boxing and he was gloved to spar with me. Ambrose's sidekick either Roger or Malcolm pulled me aside and whispered that I should be careful that Les does not pull punches, "well" they were right. Hence and behold Les did just what was expected he came at me furiously and got Ko'd. took 1 min. 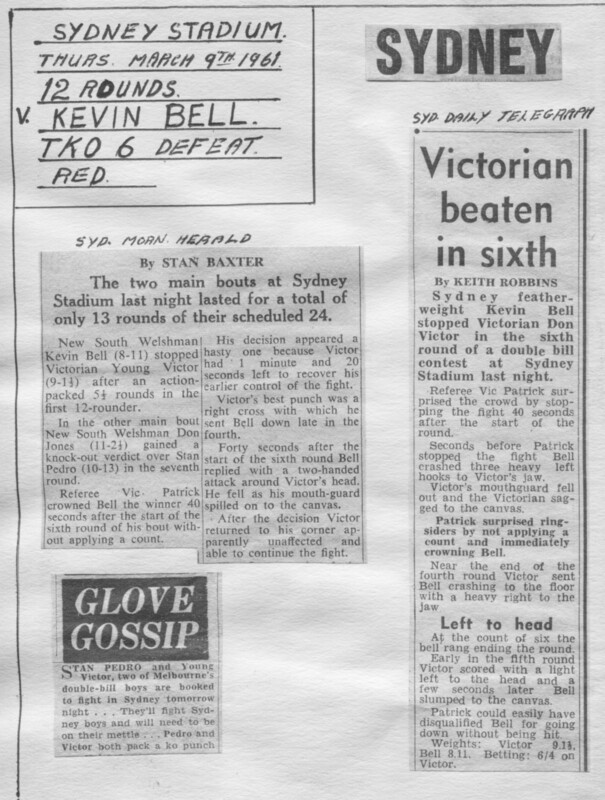 As expected no count was applied but as Ambrose removed my gloves had a smirk and held his head down as usual. Malcolm and Roger both looked away also smirking. 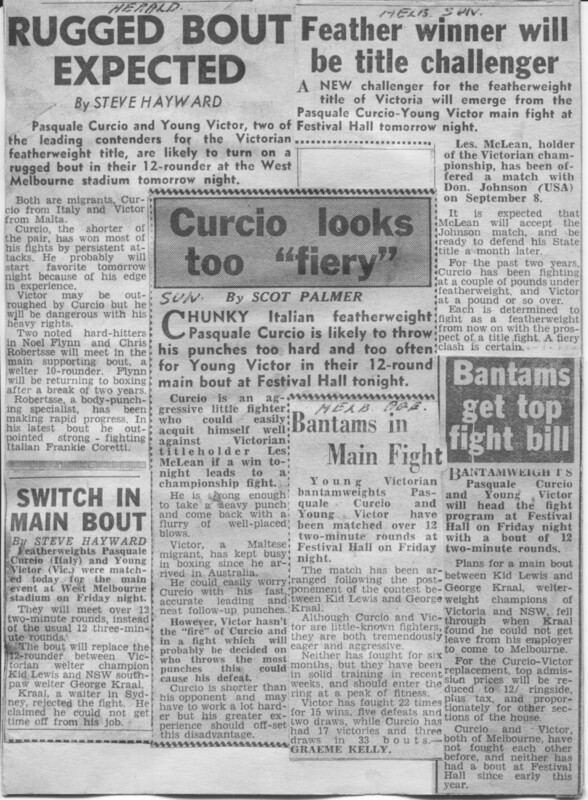 (Top/first from left) This was the very first fight and Bernie Osborne was my first opponent, the fight was over before I could blink. During the next 2 fights just like the first fight I found that in the stadium things were a little different and fighters were more serious than the gym, so this meant that who throws the most punches was the winner as the fights were only short ones. So I won the fourth with Johnny Volpi by doing just that. By the way my style here was clean cut boxing. 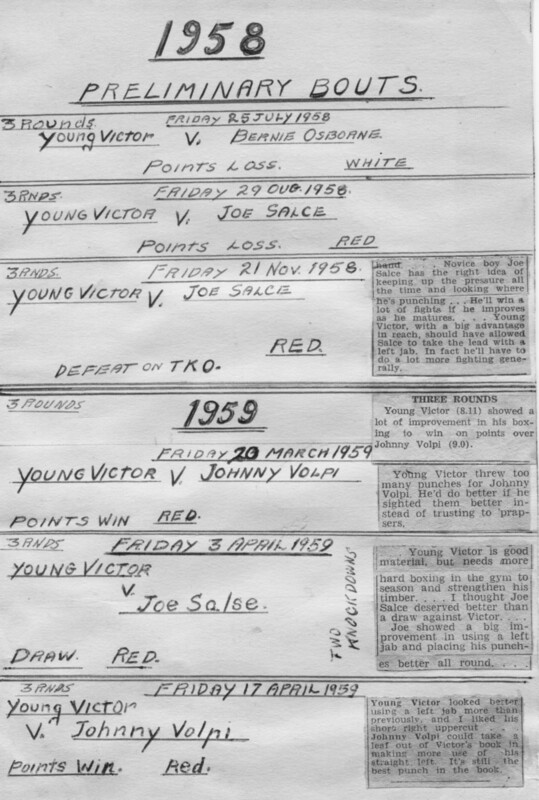 I continued my success in the next two fights with a draw with Joe Salce and another win over Johnny Volpi. My confidence was growing when entering the ring for my 7th. 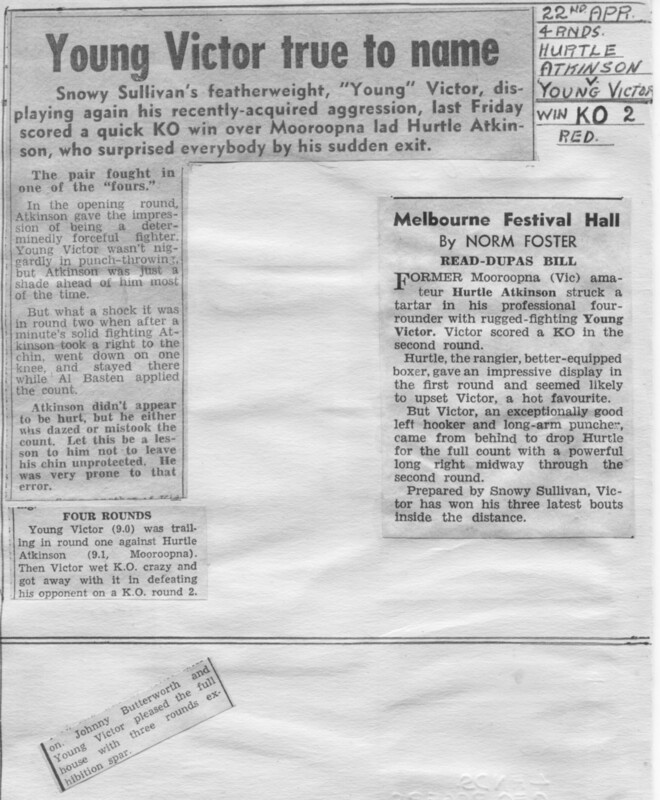 fight, in the opposite corner of the ring I discovered that my opponent was replaced by Ross Colisimo ( Ross had won 9 out of his 10 fights easily ) I was instantly petrified and never forgave snowy Sullivan for doing that to me, I remember just one punch thrown by Ross and I went down and Snowy sensibly threw the towel in. This made my recent glory very short lived and I went back to my shy and cautious way of boxing with little success. 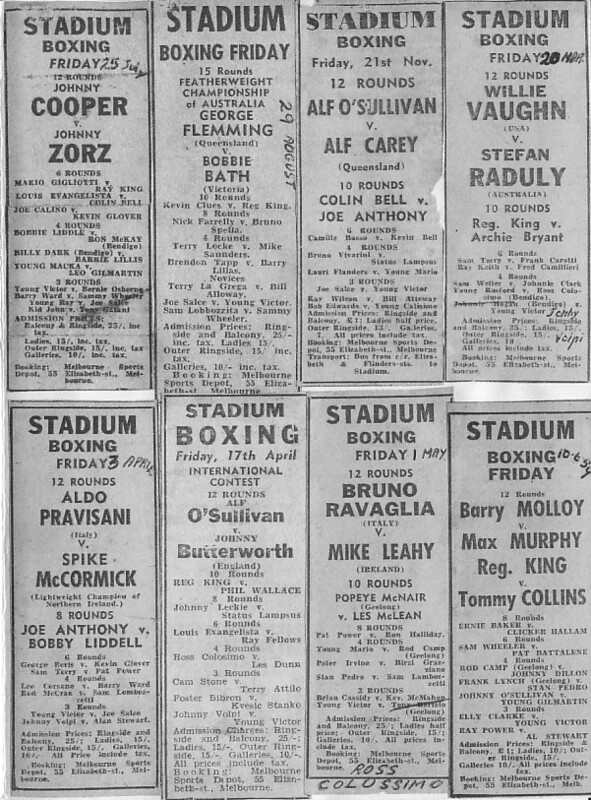 I was substituted for the fights above with Hurtle Atkinson and Johnny Preece. 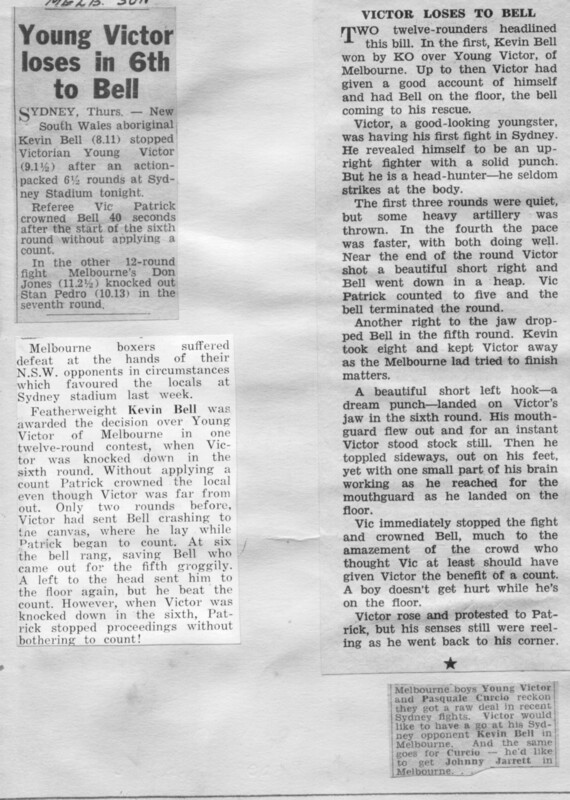 Johnny Butterworth joined our gym and had been showing me a few things as we sparred and I took a few leaves out of his book until the beginning of 1960 I just turned 19 years old and my mind seemed made up to have a good go at this game. When I met Fred Cranston over 3 rounds. in my last 3 rounder, ( the last and 11th. of my dreaded 3 rounders. ) I was a different man and ready for anything and my short but enjoyable career in boxing was really just beginning. Stadiums immediately gave me a 4 rounder, they must have figured I had enough 3 rounders and with my newly acquired aggression it was time. Well everyone started hitting the canvas and as it went I started relying on KOs as the fights seemed easier going stopping early. PS. 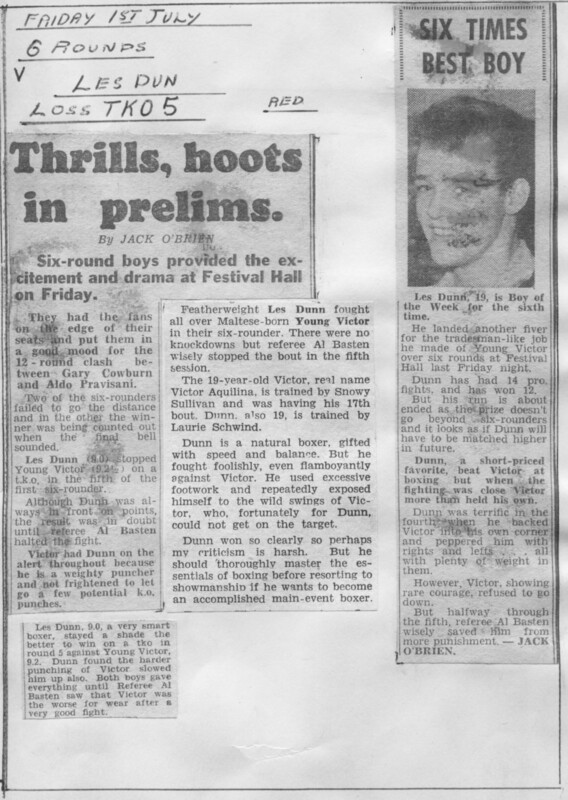 I have recently got to know Bobby Liddle again after 43 years and noticed he may have been the omen behind my newly acquired aggression in boxing in the same night he fought Les Davison 12 rnds. Sydney Billing program was missed so it is hand written. 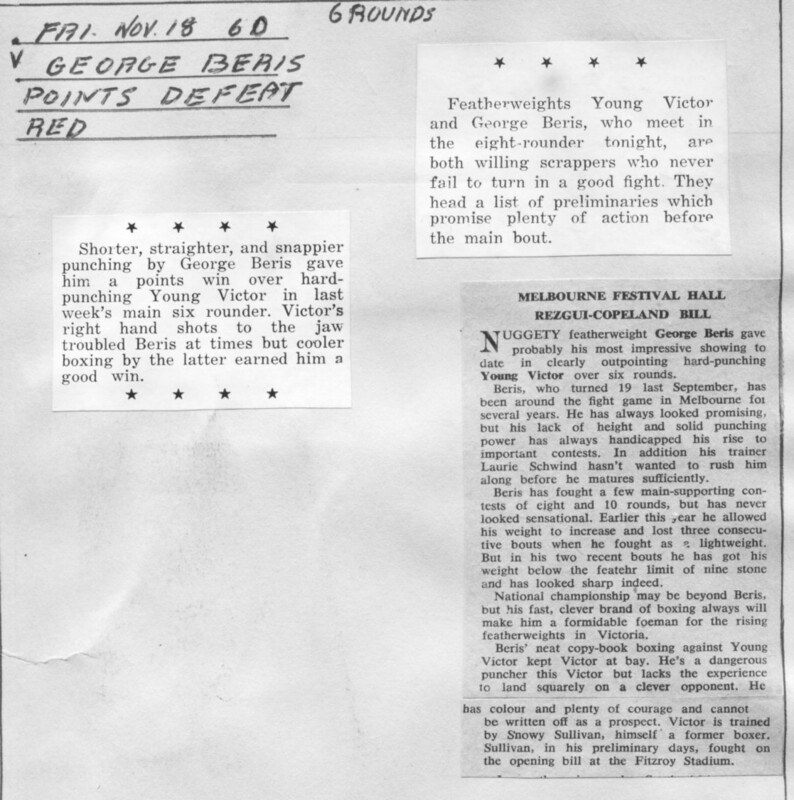 For this last fight: (Left hooks) I had joined Laurie Schwind He was tying my right hand to my neck and making me spar Les Dunn and George Beris ( of course these two loved it being both former opponents) I forgot to mention Mario Magriss but at that stage Mario seemed like a kid, little did I know that he was yet to fight Lionel Rose twice in the pro ranks. My left hook became just as potent as the right, Cec Rogers went down two times with left hooks and twice with a right, very nice man Laurie. Hope he is resting in peace. 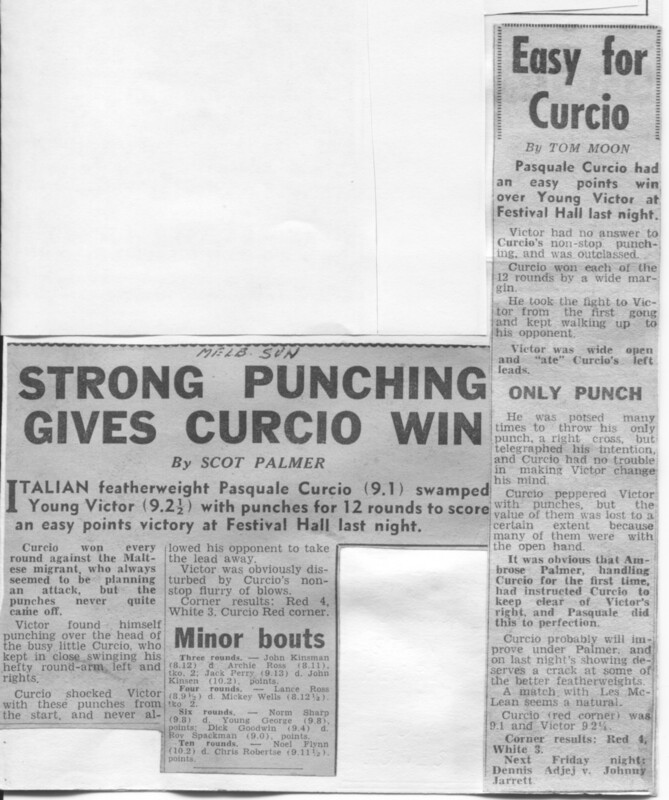 Its a shame Laurie wasn't there in my corner as my second because he would have made sure that Max Carlos (the referee) applied the full count while the ring was being reassembled as one corner went down with ropes laying around while Rodgers was laid out not being counted out. We were in centre ring (obvious sabotage) This was what it took to make me stop boxing and pursue another life in my work. 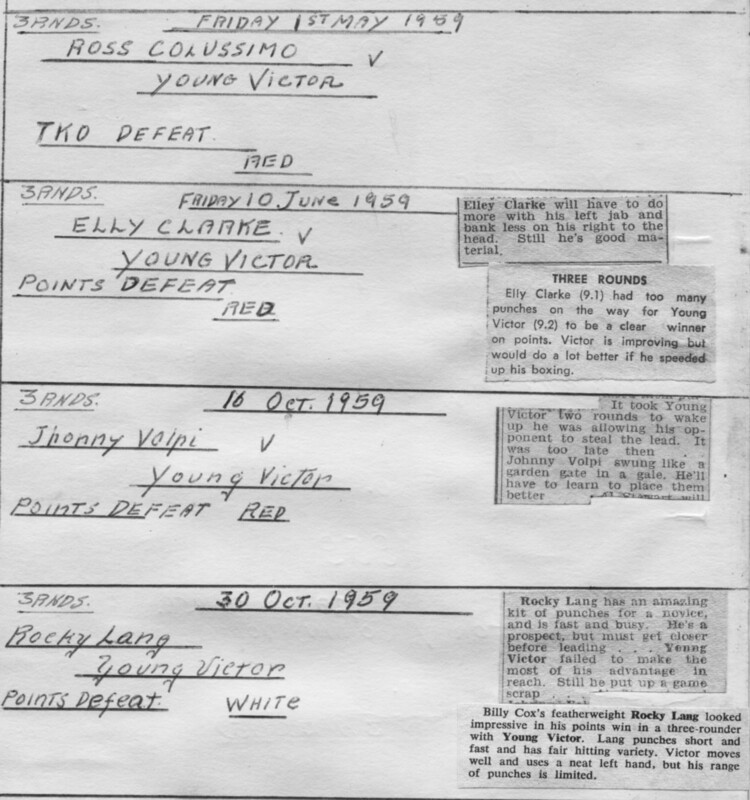 In 2009, now an old man, going by Boxrec records I made a list of fighters which were at my rank during the years of 1961/1963. 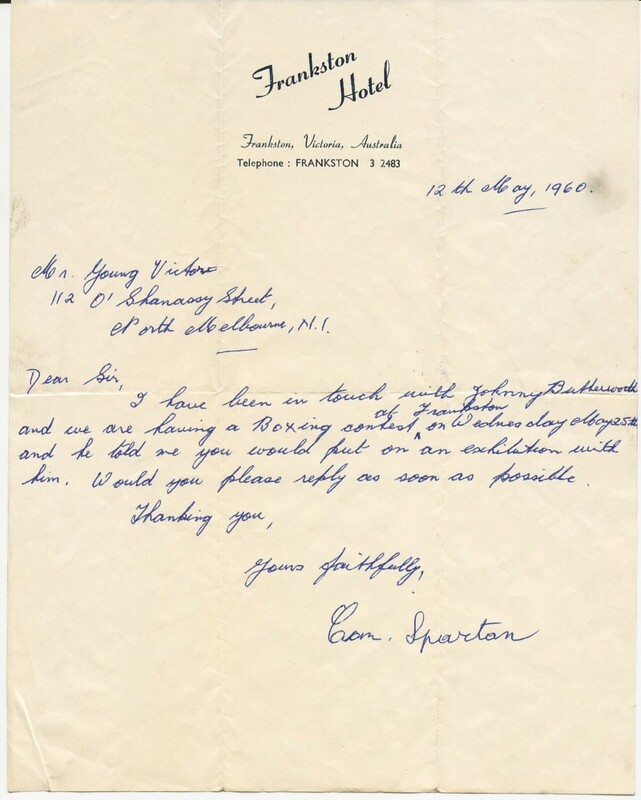 I had difficulty getting opponents which now seemed at my level after the end of 1959. 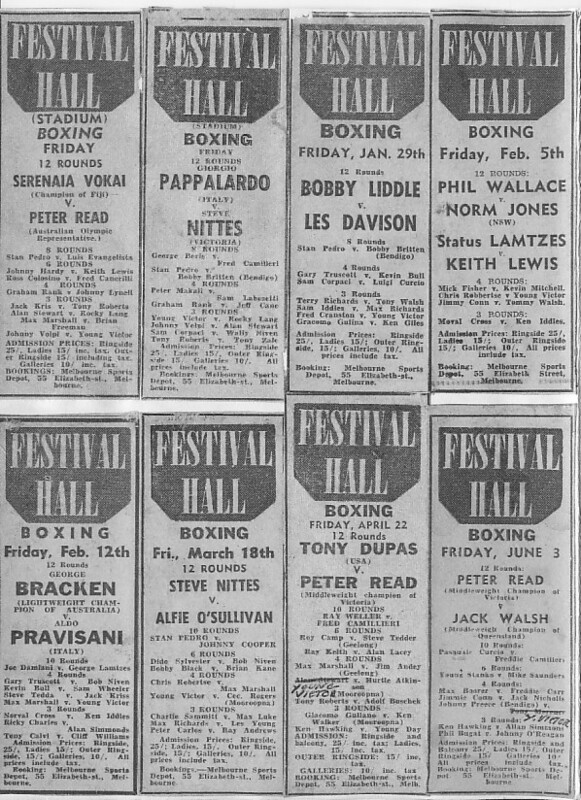 Until 1963 my trainer would tell me he could not get fights for me from these, then active fighters of the same period with similar ranking at that stage and seemed available at the times which the fights could have taken place as their records show, I never refused to fight anyone when told an upcoming contest I was lined up with. 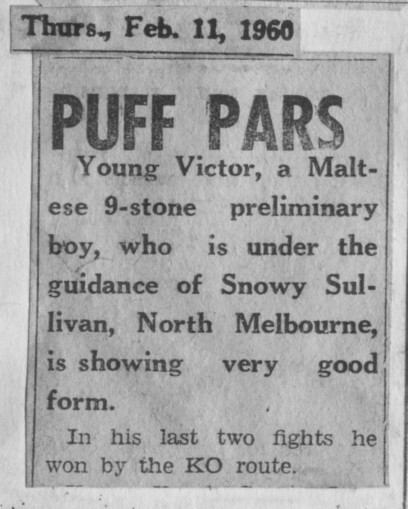 I always ask myself why did my trainer Snowy Sullivan always tell me there isn't anyone to fight? 3, 4, and 5 months went by at a time with me in wasted training times.